From spectacular Unlim 500+ drag races, held in Russia, we highlight two super tuned runners, each distinctive in its own way. 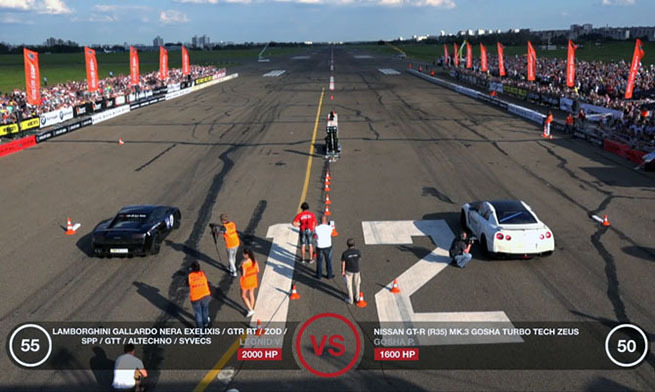 The main star is the Nissan GT-R Mk.3 Gosha Turbo Tech Zeus with 1.600HP, and the opponent is the impressive Lamborghini Gallardo Nera Exelixis, which has only 2,000 horsepower. But does the force of the “Lambo” will be enough? Halfway to the main calculation,on Nissan stands in the way Audi RS6 C6 Sportmile Stage 2, with its 780 horses ,which is real fear and trembling, but for “the Godzilla” it is easy bite.